Accelerating the transformation of its economic development will be China& #39;s priority for the new year, the country& #39;s top political advisory body said on Wednesday. Jia Qinglin, chairman of the Chinese People& #39;s Political Consultative Conference (CPPCC) National Committee, emphasized the need for the change in his opening speech at the third session of the 11th CPPCC. "We should strategically develop new sectors and the service industry, promote energy savings and reduce emissions, as well as build a circular and low-carbon economy to deal with climate change," Jia said. CPPCC members should work together to help expand domestic demand and change China& #39;s pattern of economic development, he said. CPPCC members said that the country did well in facing the global economic crisis that started in 2008, but now is the time to realize that an economy supported by high investment and high energy-consumption is not sustainable. "Although the worst time for China& #39;s economy is over, the prospect of its exports is not optimistic," Jia Kang, director of the financial science research office of the Ministry of Finance, told China Daily. "The biggest problem facing China& #39;s economy is still about economic restructuring. It is an issue we care a lot about at this year& #39;s session," Jia added. Similarly, analysts have said that changing China& #39;s economy from one based on investment and exports to one based on consumption is the key. "I& #39;m very glad that the CPPCC, as a top advisory body to the government with prominent figures from various fields, is highlighting the transformation of the economy," economist Chi Fulin said. The economic environment has changed with society& #39;s entry into a low-carbon age. The pattern of economic growth should transform in tandem with the changes, Chi said. Another issue that is being highlighted by the CPPCC is the widening gap between the rich and the poor. "We should suggest solutions to adjust the distribution of national income, enhance the fairness of basic social services and boost social insurance for the poor," Jia said. According to studies by the Ministry of Finance, the distribution of national income is now "very imbalanced", with 10 percent of the rich people possessing 45 percent of the wealth in urban areas. "Social problems caused by the great gap are prevalent," said CPPCC member Pan Qinglin. "I suggest that taxation on luxury consumption be adopted for the redistribution of social income," Pan said. 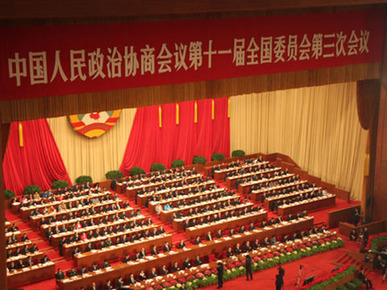 Founded in 1949, the CPPCC consists of prominent members of society who are willing to serve as advisors to the government and to the country& #39;s legislative and judicial branches.